A new study suggests that there may have been two magma oceans separated by a layer of crystalline material in the mantle during Earth’s formative period. A team of European scientists has gathered new evidence on the behavior of silica-rich molten rock deep in Earth’s interior. At high temperatures and pressures simulated in the laboratory, scientists observed structural changes in the silicon atoms that affected the density of the molten material. Such changes may have led to two magma oceans separated by a layer of crystalline material in the mantle during the early formative period of the Earth. The research was published on November 7, 2013 in the journal Nature. Earth was formed approximately 4.5 billion years ago, and at first, it was largely covered in hot molten rock. Slowly the Earth cooled and a crust formed. 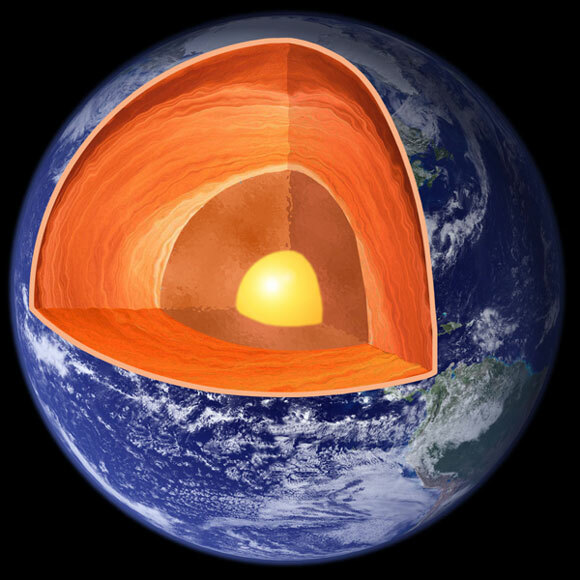 Today, the Earth is composed of several layers that consist of the solid crust, the relatively solid mantle, the liquid outer core and the solid inner core. Cutaway of the Earth showing the crust, mantle and core. Image Credit: Lawrence Berkeley National Laboratory. While scientists cannot take samples from deep within Earth’s interior, they can learn a good bit about the mantle by subjecting samples of volcanic rock to similar high temperatures and pressures in the laboratory. New research facilities are enabling these studies to take place at ever higher pressures, which is producing data about ever deeper depths. A new study subjected samples of silca-rich basalt to pressures up 60 gigapascals and temperatures up to 3000 degrees Celsius (5432 degrees Fahrenheit). As pressures approached 35 gigapascals (equivalent to about 350,000 times the pressure of our atmosphere at the surface), silicon and oxygen atoms reorganized from a tetrahedral structure with four chemical bonds into a more compact structure with six chemical bonds. This had a notable effect on the density of the material. Such changes in the mantle likely played an important role in the formation of Earth’s inner structure, the scientists say. The current data suggest that there may have been two magma oceans separated by a layer of crystalline material during Earth’s early formative period. Stishovite, a dense form of silicate material found in Earth’s lower mantle. 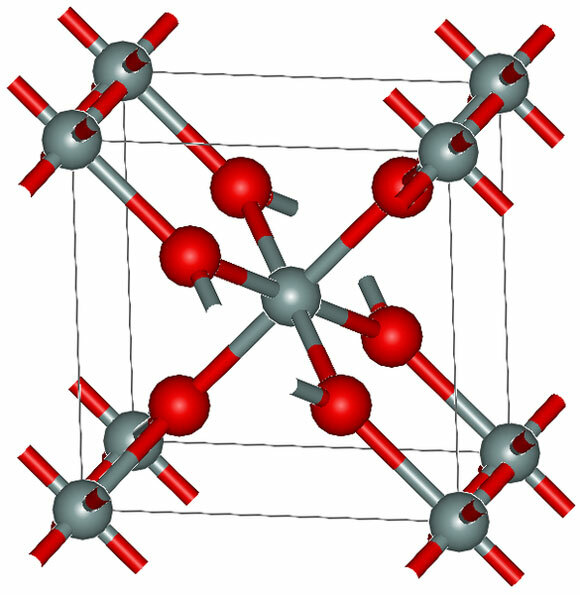 The six red atoms represent oxygen binding to a silicon atom. Image Credit: materialscientist. Modern labs make it possible for scientists to recreate conditions deep in the Earth’s core, and give us valuable insight into how materials behave at such extremes. This helps us build on what we already know about how Earth formed. The Center for Science at Extreme Conditions (CSEC) is a collaborative research program that was founded in April 2004. Researchers in the program explore a variety of cutting-edge science topics including how extremophile (“extreme loving”) organisms adapt to high pressures and how highly pressurized ice forms on outer planets such as Uranus and Neptune. The discovery of novel conducting materials that can be synthesized at high pressures and temperatures is also an active area of research at CSEC. The newly published research in Nature was conducted with PETRAIII (Positron-Electron Tandem Ring Accelerator III) instrumentation, a source for synchrotron radiation, at the Deutsches Elektronen-Synchrotron (commonly known as DESY) in Hamburg, Germany. Funding for the research was provided in part by the European Research Council and the German Federal Ministry of Education and Research. Co-authors of the study included James Drewitt, Zuzana Konopkova, Philip Dalladay-Simpson, Donna Morton, Nachiketa Rai, Wim van Westrenen, and Wolfgang Morgenroth. Bottom line: A study published in the journal Nature on November 7, 2013 has obtained new evidence on the behavior of silica-rich molten rock deep in Earth’s interior. At high temperatures and pressures simulated in the laboratory, scientists observed structural changes in silicon atoms that affected the density of the molten material. Such changes may have led to two magma oceans separated by a layer of crystalline material in the mantle during Earth’s formative period. Deanna Conners is an Environmental Scientist who holds a Ph.D. in Toxicology and an M.S. in Environmental Studies. Her interest in toxicology stems from having grown up near the Love Canal Superfund Site in New York. Her current work is to provide high-quality scientific information to the public and decision-makers and to help build cross-disciplinary partnerships that help solve environmental problems. 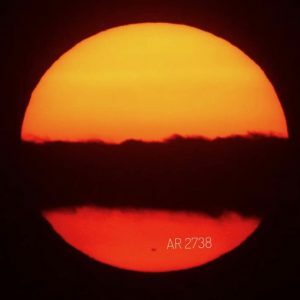 She writes about Earth science and nature conservation for EarthSky.